In our blog we’re going to travel through the history, realizing about how center pivot technology has revolutionized irrigation, in less than fifty years. Center pivot systems were born to save human labor, evolved so fast, adjusting to the expansion of human knowledge. 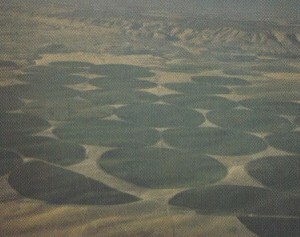 Nowadays, center Pivots are accepted as a method of water application that promotes efficient water use. Some others describe them as machines that could make it rain anytime we needed it to. The concept seems simple enough: bring water to crops by means of a water-carrying pipeline traveling in a circle about a fixed point in the center of the field. In little more than half a century, center pivot technologies have been adopted throughout the world. For the first time, irrigators could water crops with a fraction of the labor required by traditional irrigation methods. And they could do it with closer control of when and how much water they applied than was possible with gravity systems. This capability made it possible for a properly managed center pivot system to uniformly water an entire field and meet the crop’s irrigation needs while using less water than possible with a gravity irrigation system. Today, farmers carry water to all kinds of crops (avocado, sugar cane, corn, sunflower, vegetables, alfalfa, soya, rice, peanuts, melon, sugar beet, wheat, broccoli…) on a wide range of soil types and topography, some non-irrigable by other methods. Besides, center pivots have been harnessed to other tasks such as application of fertilizers and pesticides. 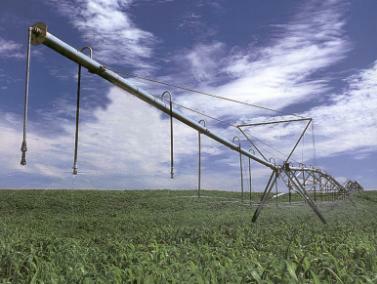 The sprinkling sound of a center pivot system is the rhythm of many farms around the world. However these machines remain a mystery to many airline passengers who look down on the circles of green not understanding what they are seeing. 3 responses to "A story of center pivot irrigation"
I am doing center pivot history for national history day project and wanted to use some information I’ve read here, with your permission. Thanks for your comments about how center Pivots are useful when spreading pesticides. I didn’t know that it revolutionized irrigation. My father is a farmer, and he is looking into center Pivots for his crops. Thank you for the information. I’m doing a project on types of sprinklers to use on center Pivots.